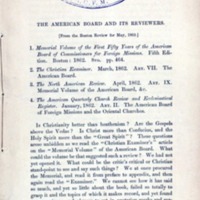 Description: Extract from the Boston Review for May, 1862, assessing contemporary coverage of the ABCFM, specifically reviews of the publication Memorial volume of the first fifty years of the American Board of Commissioners for Foreign Missions (Boston, 1862). 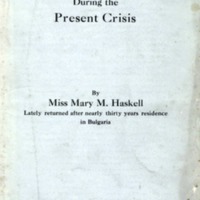 Description: Published paper, in pamphlet format, recounting the missionary work of the American Board of Commissioners for Foreign Missions in Asia Minor and Syria from 1818 to 1878. 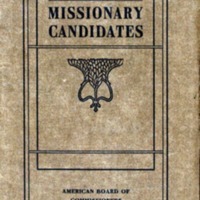 Manual for missionary candidates and for appointed missionaries before entering their fields. Description: Pamphlet providing information for persons wishing to engage in missionary work under the direction of the American Board. 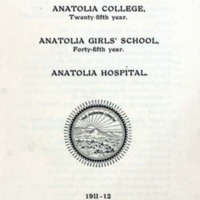 Description: Published report, for the academic year 1912-1913, of Anatolia College, Anatolia Girls' School, Anatolia Hospital, and Anatolia Theological Seminary. 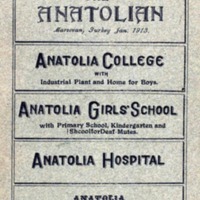 Description: Pamphlet describing Anatolia College and girls' school admissions, programs, and resources, including lists of faculty and college students. 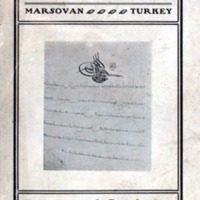 Description: Published report, for the academic year 1911-1912, of Anatolia College, Anatolia Girls' School, and Anatolia Hospital, at Marsovan, Turkey, including the college and girls' school catalogues. 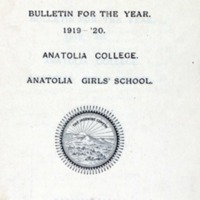 Description: Published annual report, for the academic year 1901-1902, of Anatolia College, the girls' boarding school, and hospital, at Marsovan, Turkey, including the college and girls' school catalogues. 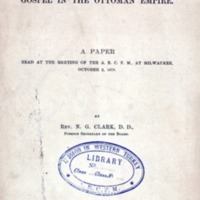 Description: Published letter, in pamphlet format, describing the current situation in Bulgaria.